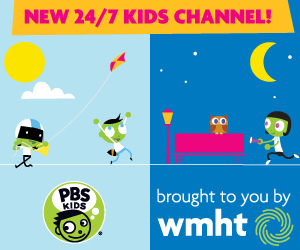 Families can stream their favorite children’s programs from WMHT for free on Apple TV, Chromecast and the PBS KIDS Video App on Android. Full-length episodes and clips from PBS KIDS programs are now available to users in the United States directly on Apple TV. In addition, the popular PBS KIDS Video App is now available on Android and compatible with Chromecast; the app is the first children’s offering available on Chromecast. The PBS KIDS Video App gives families free, streaming access to thousands of videos, including clips and full episodes from their favorite WMHT kids’ series. Making content across platforms and programs available to the community, WMHT is a trusted, go-to resource for families, helping prepare children for success in school and in life. PBS KIDS programming on Apple TV includes thousands of videos, with new content updated weekly from award-winning, trusted series that provide proven educational benefits for children. Users can access episodes and clips from favorite series such as CURIOUS GEORGE, DINOSAUR TRAIN, PEG + CAT, DANIEL TIGER’S NEIGHBORHOOD, ARTHUR, WILD KRATTS and SESAME STREET. Apple TV viewers can watch this content for free and personalize their PBS KIDS experience by creating a profile and identifying WMHT as their local PBS station.